Known to a few of my friends and family as Chicken “Ado-Bao,” this is my take on a Filipino and Hawaiian classic, Chicken Adobo. A few years ago, I started to notice that Chicken Adobo was served at majority of Filipino Parties I’ve attended. 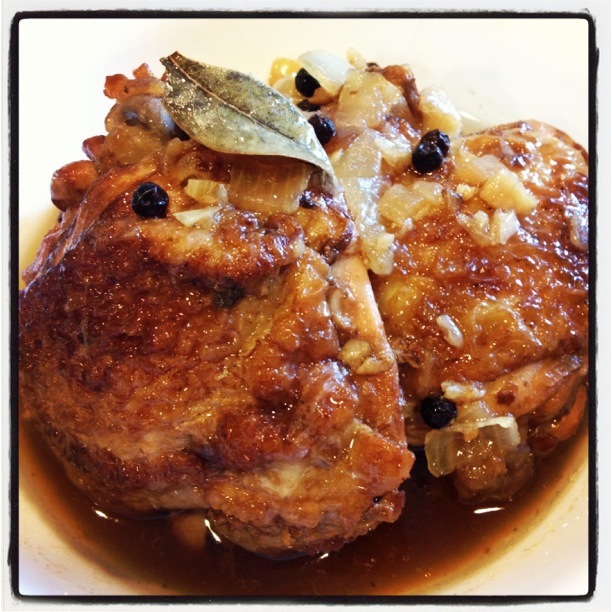 I asked a dear friend of mine to teach me how to make her family’s version of Chicken Adobo. 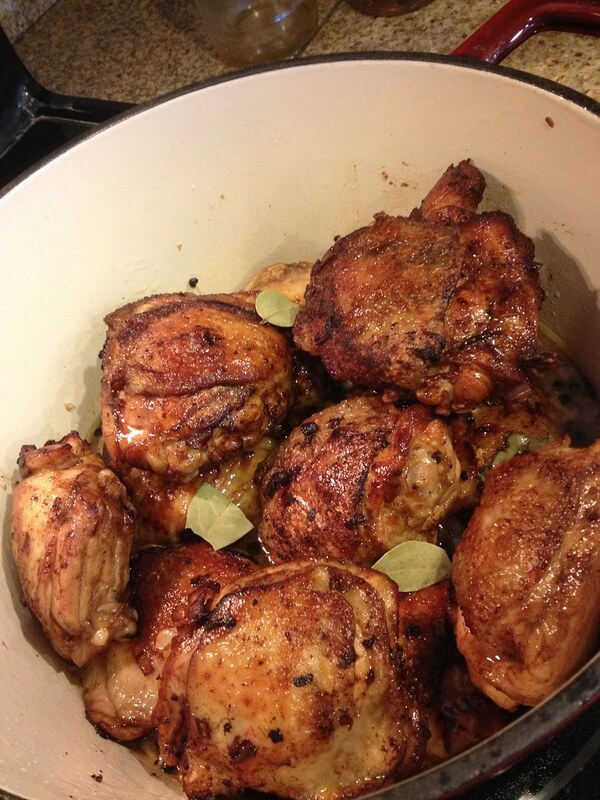 After a few years, I became a little impatient and ended up learning how to Chicken Adobo myself because the online recipes I saw looked so easy and used only a few ingredients. After I made it for the first time, I was so excited, I even invited her over to try it. She enjoyed it, but said it’s different from how her family makes it at home. So…I researched more online recipes and even did a survey on my Facebook to ask my Facebook friends how they prepare their Chicken Adobo . Everybody prepares their Chicken Adobo differently and it all came down to preference. Some people enjoy their Chicken Adobo more on the tart, tangy, sour and vinegar-y side while others prefer it more on the saltier and savory side. There’s even an America’s Test Kitchen recipe that adds coconut milk to make it creamier and to cut the acidity of the vinegar . 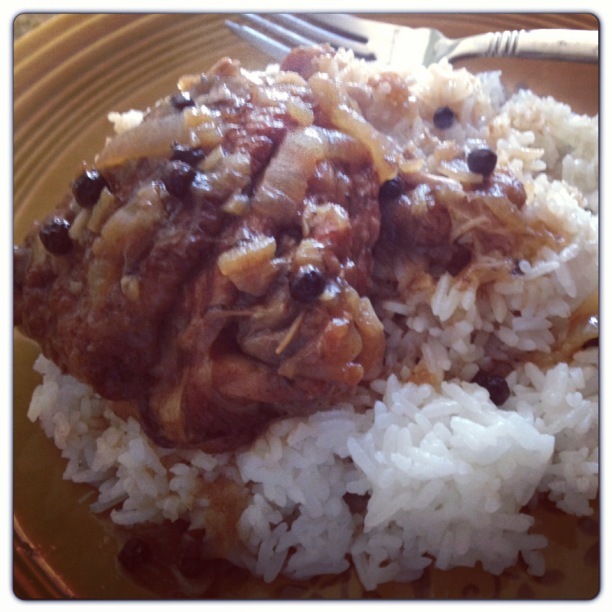 After making Chicken Adobo several times, I really enjoy a balanced Chicken Adobo with different flavors going on in every bite. In a large mixing bowl, combine soy sauce, 1/2 cup rice wine vinegar, brown sugar, and fish sauce. Add chicken, smashed garlic cloves, black pepper corns, and dried bay leaves. Marinate for at least 3 hours, preferably overnight. Add oil to frying pan on heat frying pan medium-high heat. Fry chicken, skin side down first, until browned. Add chicken to Dutch Oven or Stock Pot. Note: Chicken does not have to be cooked all the way in this step. Just brown the skin before braising in liquid. Pour remaining marinade liquid into stock pot. Add enough water to fill the chicken. Bring contents in the stock pot to a boil and close the lid and reduce heat to Medium-Low for about an hour. Remove lid and add yellow onions. depending on how you like your Chicken Adobo, you can either continue simmering the liquid until the liquid reduces to the point that it turns into a thick rich sauce or you can just eat it as is. Add remaining 1/4 cup rice wine vinegar at the end. Serve with hot rice and garnish with chopped green onions. Use any chicken combination you like as long as the skin and bone is still attached. My favorite is just chicken thighs. If you are cooking with chicken breast, you shouldn’t have to simmer for longer than 30 minutes. If mixing Breast and Thighs/Drumsticks, begin by layering the thighs/drumsticks in the pot then layer Chicken breast pieces on top of the Thighs/Drumsticks. For a creamier twist, add a can of coconut milk to the marinade. I saw this in an America’s Test Kitchen recipe. I tried it, liked it, and tasted curry-ish. going to have to make this in the near future!